I wanted kabocha squash. You don't always get want you want. The other morning when I walked to the squash section of my local supermarket, it was practically empty, well, except for the tiny area where the produce guy was rearranging the spaghetti squash. "Hey, do you have any kabocha squash in the back?" I asked. "Sorry, we didn't get any kabocha squash in this week, but we do have spaghetti squash," he said, and held one out to me, with an expectant smile. "No, the truck hasn't come in yet." "You know, that spaghetti squash looks really good," I said. "Doesn't it?" he replied, and handed me the squash. Though I'm committed to eating more kabocha squash this year, there's nothing wrong with giving spaghetti squash a little love. Or shall I say, "amore"? Because spaghetti squash needs Italian love -- grassy extra virgin olive oil, fragrant rosemary and basil, and salty Parmesan. Mangia! 1. Preheat oven to 375 degrees F. Line a baking pan with tinfoil (for easy clean up). Place squash halves flesh side down and pierce all over with a fork. Cook for 45-50 minutes, or until tender. Let cool. 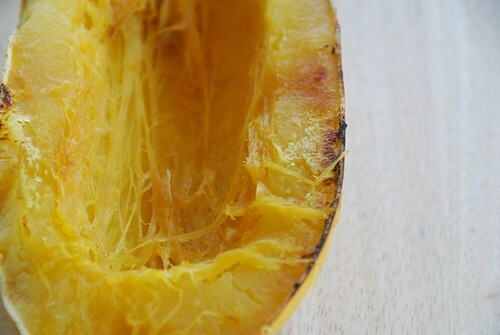 Using a fork, scrape the hot flesh from the squash and place in a bowl. 2. In a large skillet over medium-high heat, warm the olive oil. Add the garlic and cook until just fragrant. Add the herbs, crushed red pepper, salt, and 1/4 cup grated cheese, and stir. Pour over the cooked squash and stir well. Place in a serving dish. Drizzle with remaining 1 tablespoon olive oil (preferably extra virgin) and sprinkle with remaining 1/2 cup grated cheese. Serve hot. must be an epidemic. my grocery hasn't had any squash in quite a while either. sighhh. I took matteres into my own hands a few days ago and ordered 2 differend varieties of squash from Victory Seed co. which sells heirloom seeds. I've got a small spaghetti squash on my counter now... I can't wait to try this! I've never been a fan of spaghetti squash but this recipe does look good. Susan - thanks for this. 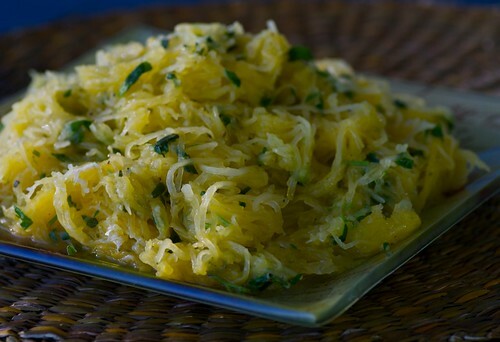 I really like spaghetti squash but I've struggled with how to make it taste "better than bland." Looking forward to experiencing "amore!" gwen-Smart girl! Which kinds did you order? patsyk-I hope you like it! meemsnyc-I never have been either, but I just love this one. gigi-Wow! I'm glad to hear spaghetti squash has its loyal followers. I think I'm starting to become one too. TW-This is definitely not bland. Use the finest olive oil you've got too. It's worth it. I've never had kabocha squash (not knowingly anyway! ), what the difference then? Love the recipe, looking for some different recipes, we grow squash in our garden so I've looking for something different to try. As soon as I get my hands on one, I'll have to make this dish, as it looks really delicious. Each year, we always make sure to plant plenty of Spaghetti squash! I prefer it over whole grain pasta ANYTIME! We have one garden squash left ... this one is reserved for your recipe!